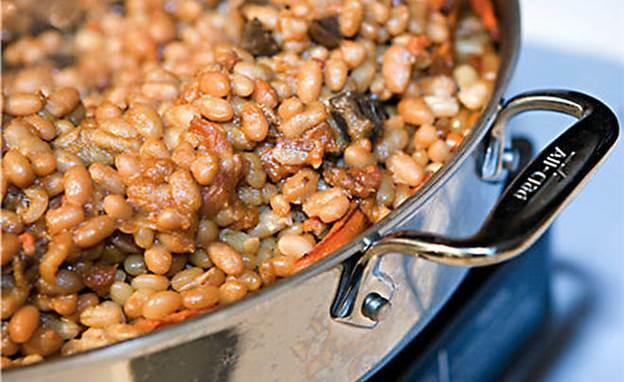 This hearty casserole of preserved duck, sausages and beans is the heart & soul of Gascon cooking. Add beans to a large, non-reactive container(s), cover completely with water and soak overnight at room temperature. Keep water level several inches above beans. Check back every so often as beans will absorb a lot of water. Use a few separate containers if necessary. Drain beans, put into a large, heavy pot with whole ventrèche, garlic, carrot, bouquet garni and onion that’s been studded with cloves. Add enough water to cover at least 3 inches above beans. Bring to a boil over medium-high heat then reduce heat to low and simmer, stirring often, until beans are barely tender, about 1 hour. Drain beans, discard onion and bouquet garni, leave carrots and garlic with the beans. Remove ventrèche, cut into 1/2-inch squares, set aside. Season beans with 1 teaspoon salt and several grindings of pepper. In a medium skillet over high heat, sear duck and Armagnac sausages until just browned. Remove from pan, cut into thirds and set aside. Lightly grease large casserole, preferably earthenware or enameled cast-iron, with duck fat, on both bottom and sides. Place half of the bean mixture in casserole. Add duck legs, browned duck sausages, chopped ventrèche, and sliced garlic sausage. Drizzle with duck fat. Cover with remaining beans. Stir tomato paste into demi-glace/water mixture, mix well until dissolved. Pour evenly over bean mixture. Drizzle with remaining duck fat. Bake until hot and bubbling, about 2 1/2 hours, checking occasionally to make certain the beans are not drying out. (See Ariane’s Recipe Tips below). NOTE: Cassoulet may be prepared ahead up to this point, then cooled and refrigerated up to 3 days. Remove from the refrigerator to bring up to room temperature before proceeding. Increase (or preheat) oven to 400 degrees F. Bake cassoulet until top is browned, about 45 minutes. If at this point, cassoulet is not heated through, cut open the crust, pour 1/2 cup of water and/or demi-glace, and continue to cook until hot all the way through. Don’t hesitate to open the crusty top to make sure the cassoulet is not drying out. The texture should be similar to a thick stew. If it seems too dry or pasty, add some liquid, such as stock, demi-glace or even water. Typically, you’ll have to cut the crust and add liquid about 3 times before it’s hot all the way through. Some cooks in Gascony think cassoulet will only be ready after seven times of breaking the crust and adding liquid! Don’t forget the leftovers. Cassoulet is even better the next day after flavors have had time to develop and marry.